Gift Nails! - Polish Etc. Today is gift nails! 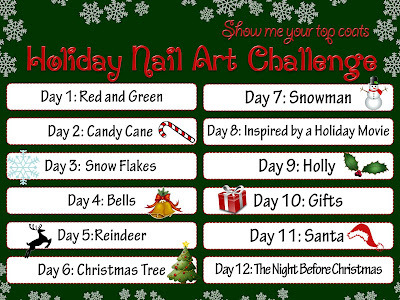 This one is my favorite holiday nail art so far. The idea wasn't my own, it was inspired by this Tiffany inspired manicure from Pinterest. I saw it and immediately thought of Christmas gifts wrapped under the tree! I just had to try it. This one is really fun and easy to do! I started with red nails (Pretty Serious Nightmaren) and added a gold stripe through three of my nails and a gold bow on my middle finger (with Essie Good as Gold). I used my middle finger since it is my widest for the detailed bow. I outlined it all with black (Sally Hansen Black Out) just to accentuate the details. I absolutely love this design! I might have to re-create this one to wear for Christmas morning. Make sure you check out the rest of the gift manicures from the SMYTC girls!